Grignard reagents will add to carbon dioxide, forming carboxylate salts. After acidic work-up, carboxylic acids are formed. 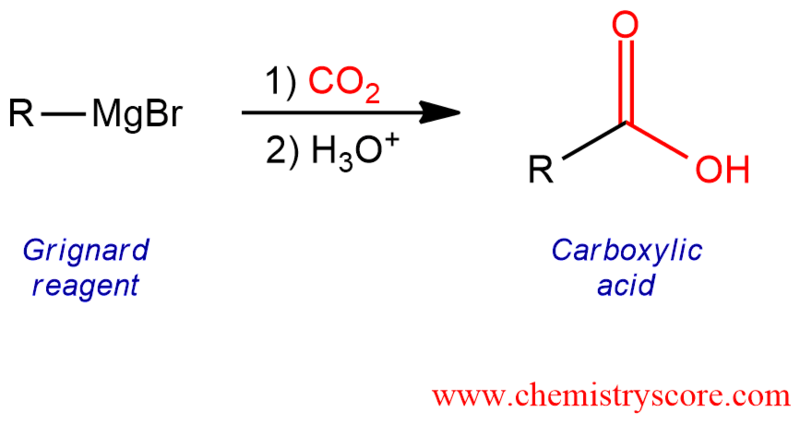 A Grignard reagent can react with carbon dioxide (usually in the solid form known as “dry ice”) to produce a carboxylic salt, which upon protonation by aqueous acid yields the carboxylic acid. This reaction is a common method for preparation of carboxylic acids. In the first step, the Grignard reagent functions as a nucleophile and attacks the electrophilic center of carbon dioxide, generating a carboxylic ion. In the second step, protonation of carboxylic ion leads to the carboxylic acid. These two steps occur separately because otherwise, the first step would take place before the other. Grignard reagents are very reactive compounds. When they are in the presence of a protic solvent, such as water or alcohol, they will immediately hydrolyze.